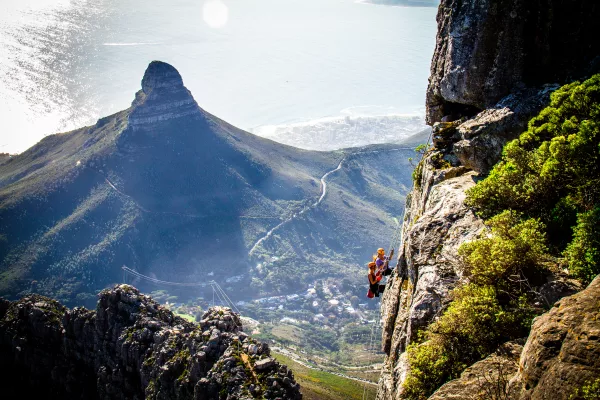 As a part of City Sightseeing’s online Active Adventures packages, the bravest of thrill seekers can take a trip to the top of the famous Table Mountain, one of the world’s 7 Wonders of Nature, to enjoy the breathtaking views as they abseil down the other side! This daring and fun activity is open to adventurers from 10 years old and upwards, with no experience needed! Minimum weight is 40kg/88.19Ibs, maximum weight is 120kg/264.56Ibs. 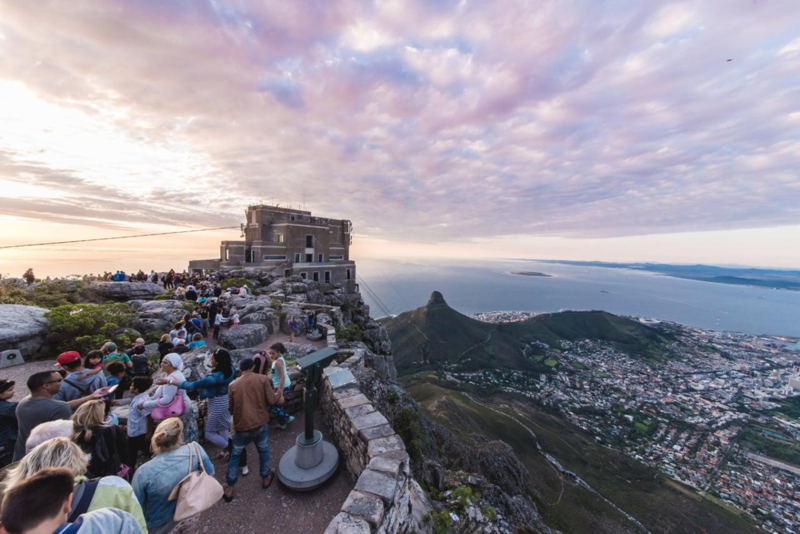 After stepping off the edge, you’ll find yourself in an exhilarating, free-flowing vertical space of picturesque views, including a panorama of Robben Island, Lions Head, the 12 Apostles and the crystal coastline of Camps Bay. While prepping for your day out, make sure to wear comfortable, loose-fitting clothes for freedom of movement, and sturdy athletic shoes for grip and protection. Put on plenty of sunscreen, and be sure to bring a camera to capture your abseiling experience. The abseiling tours run from 9:30 to 15:30, with each session lasting 1 hour. This session includes the fitting of harnesses, an in-depth safety briefing with instructions, the abseil itself, and then a short, pleasant hike back up to the summit. 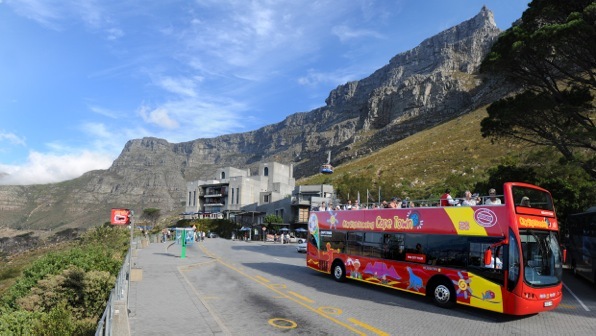 To start you’ll want to hop on the City Sightseeing red bus at any one of the red City Tour bus stops along the routes around Cape Town, with a bus leaving every 15 minutes. Then just sit back and enjoy the sights on your journey up to the Cableway Lower Station. Bear in mind that your Abseiling Adventure package does not include a cable car ticket, so be sure to purchase a return Cable Car ticket at the Lower Cableway station, at any of our City Sightseeing Tour offices, or from your bus driver before reaching the mountain. From there it’s an exciting ride up to the Table Top in a classic cable car, taking in the magnificent sight of the City Bowl, the harbour and the mountain as it flies by beneath you. Once you reach the top, you’ll easily spot the designated abseiling section, where your instructors and guides will be expecting you. Abseiling may be daunting for some, but with the careful fitting and adjustment of your harness and a rigorous safety and instructional talk before the big step-off, you can rest assured you’re in safe hands! Our experienced and highly trained instructors are with you every step of the way, offering a demonstration and continuous support. Then, it’s time to take the big step out! Firmly secured in your harness, you’ll step backwards, enjoying the scenery all the while. It’s an exhilarating experience, and perfectly safe, with your instructor guiding you from above. The route includes rock hopping, steep slopes, and ultimately vertical faces to descend. On your way down be sure to look out for obstacles and control your descent. When you near the endpoint, the instructor at the bottom will be there to assist you with landing and removing your gear. From there it’s out of the harnesses, and after your abseiling experience, it’s a pleasant hike back up to the top, with more opportunities to take some photographs. Back at the top of the mountain, you have the whole summit to explore offering spectacular views from every angle and a cafe selling refreshments, snacks and gifts to take back home. The Abseiling Adventure tours are available 7 days a week, weather permitting. If the weather is unfavourable on your chosen day, we’ll do everything we can to reschedule your adventure, with a full refund available should a different day not be possible. For cancellations, T&Cs apply, with cancellations and no-shows liable for an administration fee. Don’t miss out on a once in a lifetime opportunity for amazing views and a thrilling experience. Book on our website to guarantee your spot in a harness.